Eimear MacBride is currently Ireland’s most famous rejected novelist, but Donal Ryan has some claim to the title having amassed 47 rejections for his first two novels before The Spinning Heart was published in 2012. 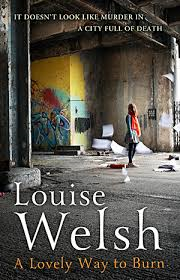 One might wonder whether Ireland’s conveyer belt of talent is simply down to persistence, or whether it is the risk taking nature of Irish writers that postpones publication but eventually reaps the reward. 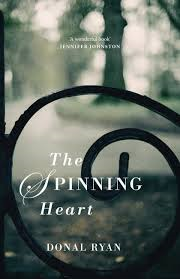 The Spinning Heart presents its own challenges for the reader, constructed as it is from 21 different voices. A polyphonic novel is not a new idea – one immediately thinks of Faulkner’s As I Lay Dying – but Ryan allows each voice to speak only once making moving the narrative forward even more of a technical challenge. There is a feeling that the good times have been taken for granted, questions haven’t been asked, and the greed of those who have prospered (Pokey Burke, whose voice we do not hear as he leaves the village, abandoning it to its fate) has damaged the rest. Ryan, however, is not harking back nostalgically to a pre-boom Ireland, as the past is best epitomised by Bobby’s father whom Bobby visits every day – “to check is he dead.” His father has spent the last few years drinking the money left to him by his father – entirely out of spite having never touched a drop while Bobby’s grandfather lived. To some extent the novel tells the story of how his reputation begins to unravel as he struggles on after losing his job. However, this would be a very simplistic view as every character’s story is foregrounded at some point, and Ryan creates some particularly strong female characters. At no point did I wish a previous character would return to take charge of the narrative, and I generally found navigating the various relationships (between characters and events) straightforward, which suggests great skill of the part of the writer. Ultimately this makes The Spinning Heart a life affirming book as well as an impressive technical accomplishment. Donal Ryan is yet another Irish writer to watch out for. You are currently browsing the 1streading's Blog blog archives for June, 2014.